The Big Wobble: Signs and wonders: The most powerful hurricane ever recorded in the Atlantic basin: Irma with 185mph winds swells to the size of FRANCE! Signs and wonders: The most powerful hurricane ever recorded in the Atlantic basin: Irma with 185mph winds swells to the size of FRANCE! NASA's VIIRS infrared data revealed very cold, very high, powerful thunderstorms on Irma's western side. Cloud top temperatures in that area were near minus 117.7 degrees Fahrenheit or minus 83.5 degrees Celsius. Storms with cloud tops that cold have the capability to generate very heavy rainfall. Sept. 5, many warnings and watches were in effect. 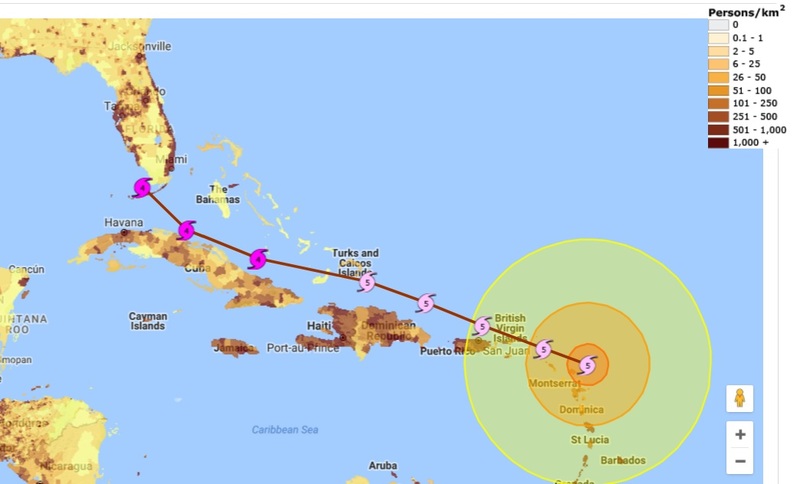 A Hurricane Warning is in effect for Antigua, Barbuda, Anguilla, Montserrat, St. Kitts, and Nevis, Saba, St. Eustatius, and Sint Maarten, Saint Martin and Saint Barthelemy, British Virgin Islands, U.S. Virgin Islands and Puerto Rico, Vieques, and Culebra. A Hurricane Watch is in effect for Guadeloupe, Dominican Republic from Cabo Engano to the northern border with, Haiti. 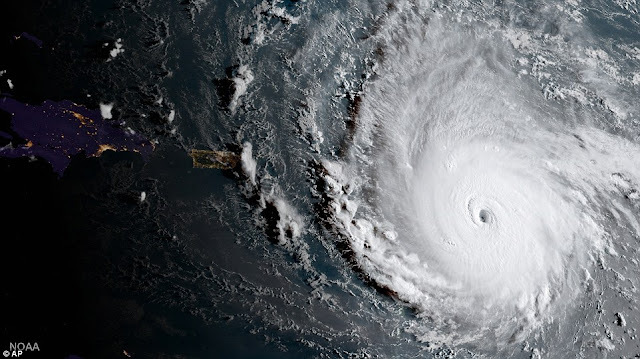 The National Hurricane Center said the distinct eye center of Hurricane Irma was located near 16.7 degrees north latitude and 57.7 degrees west longitude. 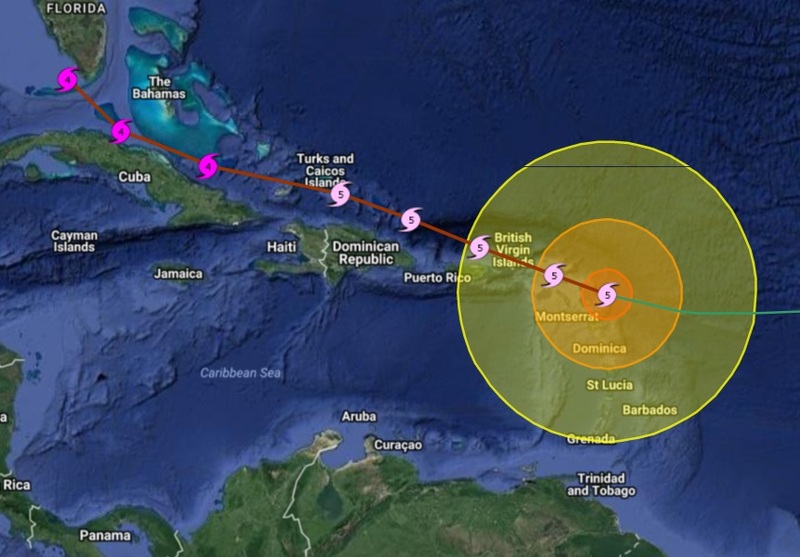 That's about 270 miles (440 km) east of Antigua and about 280 miles (445 km) east-southeast of Barbuda. Irma was moving toward the west near 14 mph (22 kph), and this general motion is expected to continue today, followed by a turn toward the west-northwest tonight. On the forecast track, the dangerous core of Irma will move near or over portions of the northern Leeward Islands tonight and early Wednesday, Sept. 6. NHC noted that reports from NOAA and U.S. Air Force Hurricane Hunter aircraft indicate Irma continues to strengthen and maximum sustained winds have increased to near 175 mph (280 kph) with higher gusts. Irma is an extremely dangerous category 5 hurricane on the Saffir-Simpson Hurricane Wind Scale. Some fluctuations in intensity are likely during the next day or two, but Irma is forecast to remain a powerful category 4 or 5 hurricane during the next couple of days. The latest estimated minimum central pressure from aircraft data is 929 millibars.